Frozen yogurt is a healthy end to your favorite meal, daytime snack and a quick breakfast, which can actually be tasty too. What you probably did not know is, frozen yogurt, or “froyo” as is popularly called, could be your next lucrative business venture. With so many kinds of flavors and textures available, opening a frozen yogurt franchise could be costly opportunity to miss out on. 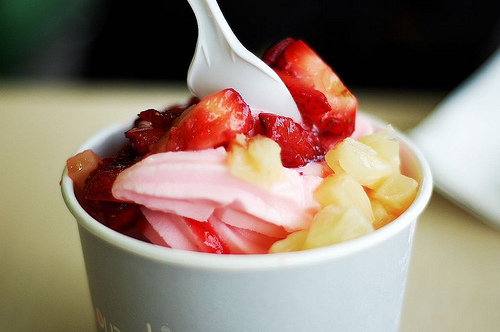 Frozen yogurt franchises are growing throughout the United States. How can you get your scoop of the market? What are the options for you to invest in? What it is like to be in the business? Like any other business, serving customers can definitely be hectic, but extremely worthwhile if done properly. To enter the frozen yogurt market, you can start your own little frozen yogurt shop. This would include sourcing your raw materials and going through the nitty-gritty of the technical aspects of manufacturing your own frozen yogurt. Sounds like a long process, does it not? Without a real working knowledge of the industry and frozen yogurt, it would take a lot of time to learn and then compete in the market. Instead of learning and starting everything yourself, you can buy a frozen yogurt franchise. In this case, you are leaving the technicalities to the experts who will provide you with a working operation of the business. In return for your franchise ownership, you will get benefits like company trade secrets, brand ownership and proven marketing strategies. While you learn more about the frozen yogurt business, you will already be enjoying profits and some free froyo on the side. The frozen yogurt restaurant industry has been steadily growing for years. Entrepreneurs can get a slice of the very lucrative pie by opening their own frozen yogurt business. Frozen yogurt recipe potential abounds. Business opportunities in this sector do too. Despite what many think, the frozen yogurt market is still experiencing high-demand, just like the smart drugs market. You can capitalize on that with a frozen yogurt franchise, like the one mentioned below. There are several frozen yogurt franchise companies. However, there is one who started it all, the TCBY. Previously known as “This Can’t Be Yogurt,” TCBY is the largest chain of frozen yogurt franchises. Without a question, they are a crowd favorite since their opening. Wile TCBY still holds their premier position in the frozen yogurt industry, serving up froyo with goodies, munchies and unique toppings, other froyo franchises are taking their scoop of the market. To choose a proper frozen yogurt franchise, you may want to see which one aligns with your personal beliefs, interests and financial ambitions. Of course, you do not definitely have to stick with offering just low-fat frozen yogurt. Who does not want a big cup of ice cream every now and then? With ice cream franchise opportunities like Baskin Robbins, you can offer your customers more options. This allows you to work with the largest frozen yogurt franchise according to the Entrepreneur magazine. Along with strong brand value, you can learn from the best and earn profitable returns with large margins when you buy a business through one of the top frozen yogurt franchises. If you want to take advantage of two trending markets, fro-yo on-the-go is the perfect opportunity. Menchie’s has an excellent frozen yogurt recipe and even better business model. And now, you can become a franchisor with the business. This frozen yogurt franchise puts a unique spin on the self-serve model by dispensing the sweet treat from a food truck instead of a store front. This is an incredible opportunity to take advantage of. Today, so-called foodies love to head to the nearest food truck to satisfy their appetites. A Menchie’s fro-yo truck also allows you to make money on-the-go for special events and visits to parks or schools. If you are looking for a franchise with the best frozen yogurt recipe and an impenetrable business model, consider a Menchie’s fro-yo franchise. Regardless of your path, the frozen yogurt market is melting quickly. Since frozen yogurt franchises are being competed for by several companies, you might have to make your claim in the market if you prefer to have a career that allows you to dress in business casual every day of your life. Many frozen yogurt franchises will limit the quality of stores in a given location to prevent unnecessary competition.